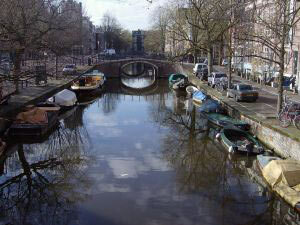 Amsterdam is believed to have been a small fishing village. It is said that the villagers who were settled on the banks of the Amstel built a bridge across the river to cross over to the other side. The wooden doors of the bridge served as a dam that held back the IJ bay. This is how Amsterdam derived its name (Amstel-Dam). Amsterdam gradually grew as a trading city, mainly the in the trade of salted herring and more famously, beer. As immigrants from across Europe started pouring in, Holland acquired a large pool of talented manpower, skilled in everything from diamond polishing to ship building. With the creation of the East India Company in the 17th century and the spread of trade to North America, Indonesia, Africa and Brazil, Holland ushered in the Golden Age. These trading liaisons sowed the seeds for what were later to become Dutch Colonies. A prosperous century was followed by a decline and recession in the late 18th-early 19th century. Holland gradually revived when the Industrial Revolution reached its shores by the end of the 19th century.